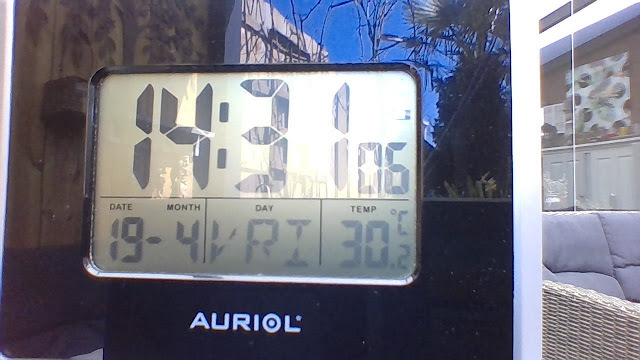 Last Friday my garden thermometer hit 30 deg C (87 deg F) in the shade which was an incredible warm week in Holland, however, the "Beast Of The East", cold air from Syberia, made sure Holland had a very cold March. With the warmest April day in the UK last week since 1949 and the hottest week in April ever in Holland with the mercury hitting 30 deg C 86 deg F, snow in North Africa, southern Spain, southern France and Italy in Europe. The entire mid-west plains of the US wiped out due to a massive spring snowstorm and temperatures pushing 50 deg C (122 deg F) in India, Pakistan and the Philippines you would be forgiven for thinking the weather was acting a little strange recently well NOAA has released their monthly global weather report for March. Arctic sea ice coverage was 2nd smallest on record. Taken as a whole, the globe just had its fifth warmest March on record, but temperatures varied markedly across the continents. Much of the Middle East and Central Asia saw well-above-average warmth, and several countries set new national March temperature records. Meanwhile, cooler-than-average conditions engulfed most of Europe; some countries experienced their coldest March temperatures in five years. The average global temperature in March 2018 was 1.49 degrees above the 20th century average of 54.9 degrees. This was the fifth highest for March in the 139-year record (1880-2018). March 2018 also marks the 42nd consecutive March and the 399th consecutive month with temperatures above the 20th-century average. The year-to-date average global temperature was 1.33 degrees F above the 20th-century average of 54.1 F. This was the sixth warmest average temperature for the year to date on record and the coolest such period since 2014. The average Arctic sea ice coverage (extent) in March was 7.3 percent below the 1981–2010 average, the second smallest extent since records began in 1979. On March 17, the Arctic sea ice extent reached its annual maximum at 5.6 million square miles, the second smallest on record. The four smallest Arctic sea ice maximum extents have occurred in the last four years. Antarctic sea ice coverage in March was 12.4 percent below average, the seventh smallest on record for March. The globally averaged land-surface temperature ranked seventh warmest for the month March and sixth warmest for the year to date (January–March). The globally averaged sea surface temperature was fifth warmest for both March and the year to date. Africa had its fourth warmest March on record; Asia, its eighth; Oceania, its ninth; South America, its 16th; North America, its 19th; and Europe, its 69th.